His directorial debut was not until 1988 with PIRAVI, which attracted tremendous acclaim. Selected in no less than 70 International and National film festivals, amongst them Cannes, it received 31 awards, including the prestigious Charlie Chaplin Award at Edinburgh, the Silver Leopard at Locarno, the Special Mention of Camera d'Or at Cannes, the Silver Hugo at Chicago and President of India's Gold Medal Award for the best film in the year 1989. His second film SWAHAM was received with equal praise selected not only in the official competition at Cannes in 1994, but also invited to numerous international festivals gathering a large number of awards. VANAPRASTHAM, the last dance, his third film. It was also his third to be selected at Cannes Film Festival, an honour bestowed on only a handful of directors in the world. The film has been adjudged as the best film of the National film Festival of India in 1999 and has also won several National and international recognitions. NISHAD, his fourth film in Hindi language, completed in May 2002, and premiered in Fukuoka International Film Festival held september 2002 at Japan. His latest film was titled KUTTY SRANK with Mammootty playing the lead role. The film won the best year film award at National Film Awards 2010 and was screened in over 45 international film festivals. The film was released theatrically in Kerala on July 2010. As a short filmmaker , he has been awarded gold medal from the President of India in 1996 and won many honours from International Film Festivals. Besides making films, Shaji Karun has been active as a juror at many international film festivals and an active participant in governmental and academic arenas. He was the premiere chairman of the Kerala State Chalachitra (Moving Picture) Academy, the first academy for Film and TV in India and was also the executive chairman of International Film Festival of Kerala from 1998 to 2001. For his achievements in cinema, the Government of India hounoured him by Padma Shri, the fourth highest civilian award in 2010. 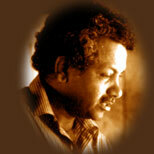 Earlier in 2000, the state government of Kerala had honoured him by the state's civilian Award 'Prathibha Pranamam'. In the same year, he has been decorated with the Chevalier dans l'Ordre des Arts et Lettres by the Ministry of Culture, the government of France.